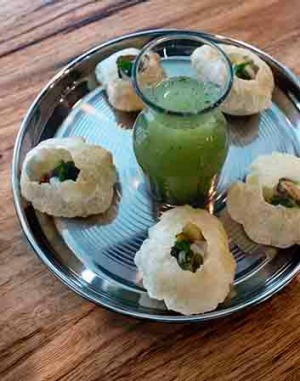 "It's a puri and it's also a party," says our friendly waiter at Delhi Streets, a new Indian street food eatery that's all about festive fusion. Puri is puffed dough - the Indian version of choux pastry - and it's usually a palm-sized snack. This version is a petite shatter-crisp globe containing curried potato, chickpea and tamarind chutney. That's a party in itself but the real revelry is the vial of spiced broth to be tipped into the puri. 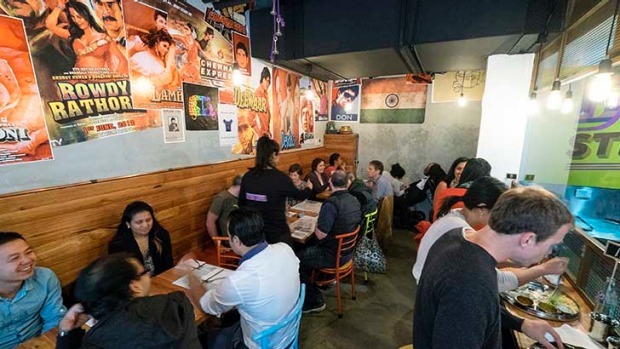 It's a one-bite fiesta and a fun, zingy introduction to a cheap, casual, light-hearted restaurant. A classics section of the menu includes biryani (rice pilafs, not as fluffy as they could be) and thali (complete meal on a tray). The lamb and chicken curries with the carnivore's thali played the flavours true but the spicing safe. That's a sign that Delhi Streets doesn't bear strict resemblance to the streets of Delhi but it's still a very happy spot for weekday lunch and cheery night-time bites.